Today, we’re happy to introduce Azure DevOps service status portal which helps with real time insights into active service events and provides further details on the event being investigated. This portal replaces our current experience using this Service blog. No new posts will be posted to this blog and existing subscribers are encouraged to use the rss feed that exists in the new portal. On Tuesday, 4 September 2018, VSTS (now called Azure DevOps) suffered an extended outage affecting customers with organizations hosted in the South Central US region (one of the 10 regions globally hosting VSTS customers). On 22 May 2018, Visual Studio Team Services (VSTS) experienced a major incident across multiple regions between 15:00 and 16:55 UTC. An event in a Western European scale unit of the Team Foundation Service (TFS), caused a chain reaction that sporadically took other TFS scale units offline in other regions. A week ago we posted an incomplete postmortem and are now following up with the completed version. If you want the full story of how we progressed through this incident, start by reading that. This postmortem will cover the full root cause analysis but it won’t rehash the first part of the investigation. On 7 February 2018 we had an incident which impacted users in our Western European scale unit. During this time, users experienced slow performance and 503 errors (service unavailable) when interacting with VSTS services. 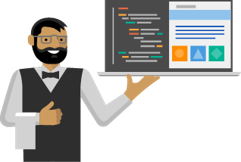 On 14 December 2017 we began to have a series of incidents with Visual Studio Team Services (VSTS) for several days that had a serious impact on the availability of our service for many customers (incident blogs #1 #2 #3). We apologize for the disruption these incidents had on you and your team. On 6 December 2017 we had a global incident with Visual Studio Team Services (VSTS) that had a serious impact on the availability of our service (incident blog here). We apologize for the disruption. Below we describe the cause and the actions we are taking to address the issues. On 16 November 2017 we had a global incident with Visual Studio Team Services (VSTS) that had a serious impact on the availability of our service (https://blogs.msdn.microsoft.com/vsoservice/?p=15526). We apologize for the disruption. Below we describe the cause and the actions we are taking to address the issues.